Well I logged on to make a progress update from the weekend and I read that I have had over 970 views! That’s almost a thousand in afew short months. Although we moved into Maes-y-Delyn over 12 months ago and I had begun blogging, I only started receiving views when I made an effort to blog more often and actually told people about it. So I am really amazing (and honoured) that I/ we have had so much interest. As I have loved writing this (though must admit I’ve been a little lacks over the past few weeks). So thank you. And I hope you continue to visit. Now back to the weekend. Well I’m solo for the next few days. Matt left for the outback on Friday for a boys outback trip- camping, hunting and fishing. So hopefully they all come back in one piece with some great stories (and hopefully a few pics too). But since then poor Madog has valiantly raced up the garden to greet every little red car or dark 4x4 that’s turned up the road. And he looks so lost and disheartened as it continues to drive on. Even though he has peed on both our cars earlier that day- so is well aware that they are in the shed. It’s the first time he’s been separated from Matt since we brought him home last year. Other than his time at the vets. So I hate to think how he would be if I went away for a few days… or worse both of us! Ffion making the most of Dad being away! Walking both dogs on my own has been challenging. I did manage both yesterday, although I did walk them away from any other properties that face onto the road, problem being its not that far. Not that either of them are badly behaved, but I don’t want to chance any confrontation. Given that Madog alone weighs about the same as me. Previous to yesterday I had walked Madog first and then taken Ffion for a run. Issue with this is placing the other dog in a crate til I return. With Ffion this is not a problem. Madog however howls the whole time- it’s a heart breaking sound! But I must persevere. This morning was the first day I’ve worked since he left, so hoping to bring some normality to our routine. So all animals fed and watered as usual. I didn’t have any trouble from Rocky this morning (our resident Light Sussex rooster). He did attack me, or more specifically the red feed bucket on Friday- soon after Matt set off. So I am not sure what instigated this most recent attack, whether he could sense Matt wasn’t returning and was asserting some dominance. Or whether it was the red bucket that had upset him. As on previous face off’s, which appeared to have been his protecting of a mothering/ nesting duck. Or more recently a jealousy over particular chook who sort refuge on my shoulder (like a parrot). On each of these recent occasions I have had a defending/offending bucket, to protect myself. So I am unsure if he was getting in there first. As since he snapped the handle and I have used a blue one, he’s taken little notice of me? I am really don’t know whether birds, or more specifically chickens see in colour? I would assume so since the males are so colourful to attract a mate??? So I will avoid red buckets in future- just in case. I had threatened him that I will keep one of the beautiful roosters growing out the front, instead. If he becomes aggressive. 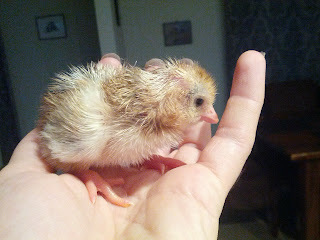 As all four of the first purebred Sussex chicks we raised have turned out to be roosters (even the smaller one I had hoped would be a hen). I did sell one on Friday, to a friend of a friend- she’s driving about 180kms (112 miles) for him! The others will be dinner when Matt gets back, along with a few ducks- as they should be big enough by then. Although there’s two I’d rather save, but we can’t keep them- the lovely coloured male and what I think is the only hen. I was actually watching the end of ‘Gourmet Farmer’ Thursday night (sort of a Aussie version of River Cottage) a food critic Matthew Evans moves from Sydney (I think) to live off the land in Tasmania. They were actually ‘dispatching’ (their words) excess roosters, for the table (his first time). Something I can relate too. And their method was similar- though we don’t go for the whole head, and I am yet to try scolding to pluck, as we just skin ours. But one of the ladies helping him, and showing him how to do it quickly and effectively, as humane as this process could be was a previous vegetarian. Though now she feeds her family only ethically raised/ killed meat… mostly her own. I could relate to this and admired her commitment. But she made a very interesting comment. 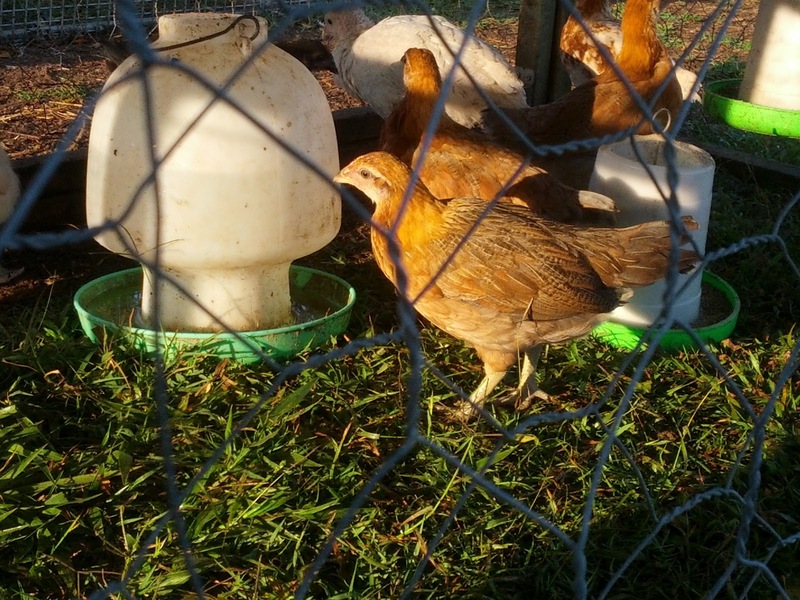 Her and her family eat chicken once a fortnight- to many households not that often. But as she explained this meant she had to undertake this unpleasant, but necessary task and kill 26 chickens a year… Now I had been complaining about how many roosters we had raised in the effort to raise a few hens to point of lay (we’re still waiting, though I think we have 5 Old English crosses from 9- our best odds yet). So as a roast chicken, will easily feed the two of us for most of the week- probably 2-3 dinners and lunches, plus stock. I guess with my family coming to stay at Christmas (so more mouths to feed) we will be grateful for our surplus roosters (and ducks) soon enough. 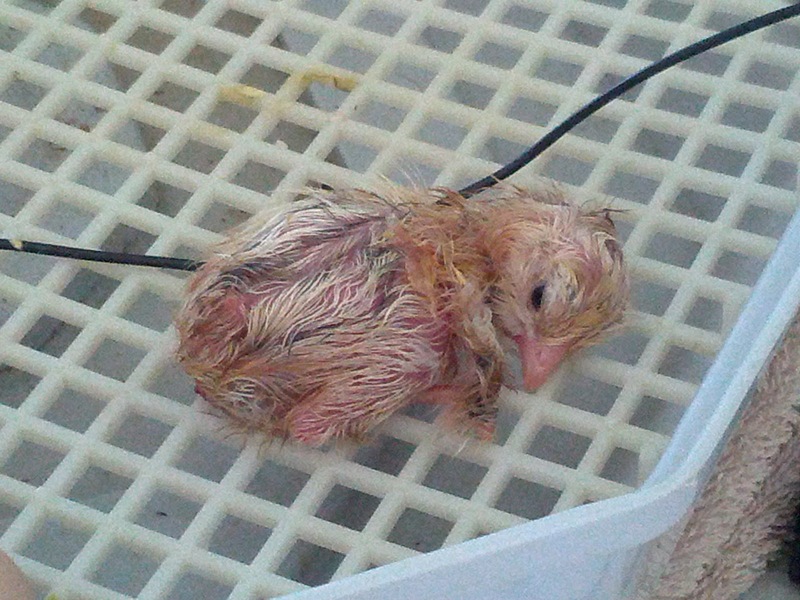 These guys look like little ET's when thier first hatched! We also had a few hatchlings last week- 6 of the dozen Indian game eggs. 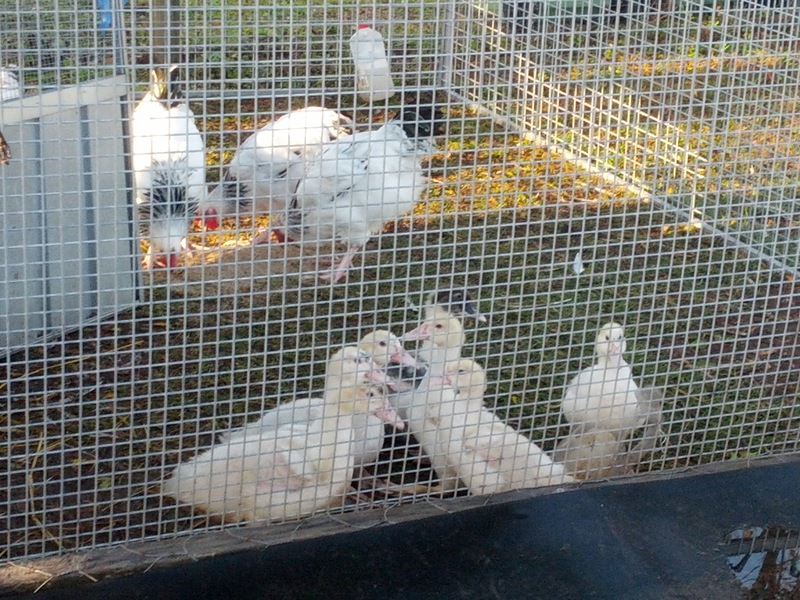 They were al fertile and developing, but only half hatched... maybe this is what they meant by low fertility rates? But am so happy with the 6 we have, to go with the four slightly older ones. Am going to try a technique of feather sexing I saw a clip of. And then going to mark them and see if its accurate. Apparently it works on all breeds, just some are easier to distinguish than others... So will try and take photos tonight. The Indian games are so much smalle than out other chicks- even at the same age... they're just so cute! Otherwise I spent much of this weekend starting my big plans for Matt’s return. I’ve ordered soil; to finish the back (where we removed the tanks). I also want to raise the front path and line it with weed matting. So come the wet season our feet stay dry and to prevent so many weeds making their way up. And so prevent the dirt below mixing with the pebbles in the rain. The path looked lovely when we first moved in. I just do not understand why they didn’t take the time to line it before they laid it? I also plan to fill the garden bed that we begun clearing, beside the shed ready for planting out as a herb patch and filling all the wholes surrounding the house; from the previous owners dogs. 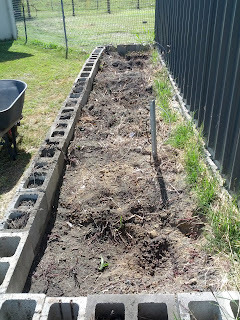 Before using the remaining soil for my planned salad beds. I’m planning on turning a few pallets into mini veg patches for salad leaves and smaller items such as my bunching onions. I also have a few more jobs planned around the existing patch- including lining and mulching the walkways between the beds. And building up the ‘wild’ bed at the end of the garden into fenced rows. I am hoping to use these areas to train my vine plants. So plenty to do! So Saturday I made a start on the shed/herb garden. The previous owners had planted a few yuccas and other drought tolerant, spreading plants in it. I guess it was meant as a screen, since the living area windows over look the shed. But it’s not as if we don’t know its there? All these plant are common in landscapes, but according to the local Land care Association a severe risk to local and native vegetation. This sort of confirmed our thinking of taking them out. As this ‘tropical garden’ was not only now blocking any sunlight in the shed and I ad fears as to how far the roots had spread or would spread into its foundations. But the deal breaker came when I was weeding and found a snake skin. It wasn’t very big, but with good foliage cover and a potential food source (as our chicks live in the shed) It was a no brainer- the tropical garden was coming out! Well Matt had cut them all down and we had bought a saw, specifically for the job. So I set to work… deciding cutting them down into manageable chunks would be a long and exhausting process. And since we’re planning on reusing the beds, really we needed the roots out too. So I set to work with the mattock, shovel and steel bar. The smaller trunks were freed Saturday, the larger had to wait until Sunday as I had to wait for the swelling on my left hand ring finger to go down and I had movement back. 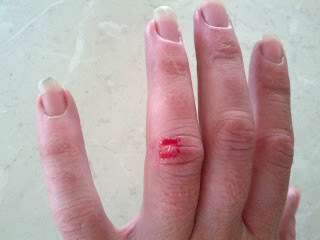 After my enthusiastic work led to my finger being wedged between the mattock handle and the concrete bed edging! The largest trunk posed a bigger problem… how do I get it out? The answer, deconstruct the wall, some rope and the car! 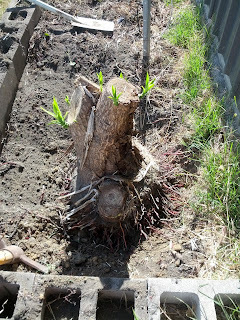 I then weeded remaining soil and pulled out as much of the yucca roots as I could, ready for the new garden soil. 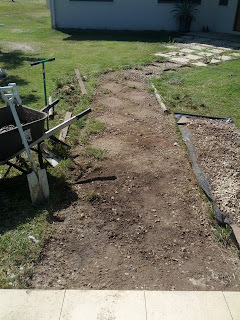 I also begun lining the garden path. Obviously this involved lifting the original pavers and stone chips, pulling out any (the many) offending weeds and grass, then laying the weed matt. 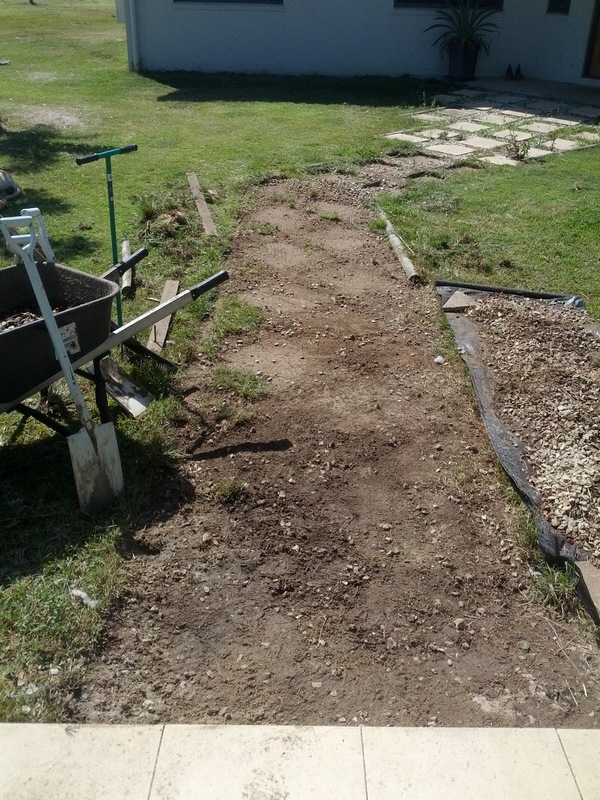 Before relaying the washed pavers and stones… I am half way. The other end can wait until the soil arrives, to raise the low spot. So still plenty to go. I am most excited about finalising my garden beds. And getting my new seedlings (mostly raised from seeds) in. So hopefully I’ll have many photos by next week. And hopefully a surprised (but happy Matt).